The fall out from Surrey Mayor Dianne Watts State of the City report Tuesday, has raged far & wide in the BC papers and on the blogosphere, not unexpectedly much of the debate has centered on the link between transport or transit, development or land use and city planning, residential unit design or population density. D.M. Johnston, perchance too provocatively wrote in Stephen Reesai??i? ?s blog `Transit is to move people, not shape land use. This is the mistake we have made and continue to make with our transit planningai??i?? Stephen roundly criticised Johnston for down playing the link between transit & development, which in my view was a tad iniquitous as Johnston was merely in my view, albeit simplistically, making the point that too often city planners have used transit as an excuse to advocate for high rise, high density residential dwellings; no where is this more prevalent than in Vancouver. The trouble with Vancouver is that the politicians want to redevelop lands into high rise apartments and condos, to provide customers for the SkyTrain metro system – the rest of the transit system has been left to rot with indifference. After thirty one years of SkyTrain only thinking; our regional planning has been left completely warped to such an extent, that it is all but useless. The years of SkyTrain building have perverted land use planning so much that it supports the SkyTrain system rather than looking at what is actually desirable and environmentally sustainable, massive high-rises being not. Transit Orientated Development TOD, is not a 21st century phenomena; from the humble beginnings of transport infrastructure expansion ai??i?? roads, canals & waterways initially in Europe andAi? ?latterly in North America; residential and commercial expansion soon followed the horse and cart, stage coach and river boat. In Britain, the coming of the railways was manifested by Railway Mania, an instance of speculative frenzy in the 1840s. It followed a common pattern: as the price of railway shares increased, more and more money was poured in by speculators, until the inevitable collapse. It reached its zenith in 1846, when no fewer than 272 Acts of Parliament were passed, setting up new railway companies, and the proposed routes totalled 9,500Ai? ?miles (15,300Ai? ?km) of new railway. Stephen Rees will be aware of the London Metropolitan Railway, which opened in 1863 and was progressively expanded over the next sixty years. Metroland is a name given to the suburban areas that were built to the north west of London in the counties of Buckinghamshire, Hertfordshire and Middlesex in the early part of the 20th century, and were served by the Metropolitan Railway. Metroland, so beloved by poet John Betjeman was “a country with elastic borders that each visitor can draw for himself”. In 1903 the Metropolitan Railway developed a housing estate in Middlesex and formed its own Country Estates Company in 1919, the first of many such enterprises over the next thirty years. 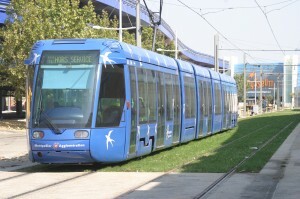 Fast forward to the 20th/21st century; surface Light Rail systems developed in Croydon, Manchester & Nottingham have regenerated & rejuvenated areas of depravation and have brought inward economic investment to those cities with employment; civic, retail & commercial developments and an improved sense of community well being & civic pride. The Grade separated ALRT system, the Docklands Light Railway DLR, originally opened in the 80ai??i? ?s and with several extensions already in operation and with further routes planned, has been an important catalyst in the London Docklands regeneration. Built predominantly on the formation of former heavy freight railway routes, the DLR is an excellent example of the reuse of an existing transport infrastructure to meet the planning requirements of later generations. The 19th century in North America was characterised by the opening up of the continental interior, linking existing communities & developing new towns & cities, the new railroads were the key to the expansion and economic growth. In the US, the Overland route – Central Pacific Railroad of California & the Union Pacific Railroad constructed between1863 ai??i?? 1869 and the Canadian Pacific Railroad completed 1885 were instrumental in the settlement and development of the West;Ai? ?Omaha, Cheyenne, Denver, Salt Lake City & Las Vegas; Winnipeg, Saskatoon, Regina, Calgary & Edmonton. The successors to the 19th century transcontinental railroads, the Intercity & International High Speed railways, have not so far had the same impact on economic expansion & growth. In Britain the rural Nimbys are challenging the case for the high speed HS.2 line between London, the Midlands & the North West, citing an insufficient financial & economic case, disruption and property blight. In the US Obamaai??i? ?s plans for 17,000 miles of high speed railway linking the continent, is being delay by Federal spending cuts, Congressional & State opposition from the Republican Party. Only in France, has the TGV Train Ai?? Grande Vitesse building programme gone relatively smoothly, with the mayors of Communes lobbying Paris, for their town or city to be linked to the TGV network. In the 20th century, constructing a National road network, with miles of motorway, freeways & autobahns, linking towns & cityai??i? ?s became policy for governments in Europe, Canada and America as the clamour for the individual freedom that the automobile promised grew. The result was the strip development and malls, linking the suburbs of many Canadian & US towns & cityai??i? ?s and Ribbon Development in Britain. The Restriction of Ribbon Development Act of 1935 was designed to prevent the sprawl of towns and cities across the countryside. ‘Ribbon development’ is linear development of long rows of buildings built along main roads leading out of towns. In British Columbia, Mayor Watts of Surrey has taken the first step in the redefining of her community, by calling for surface Light Rail and rejecting the push to extend SkyTrain in to Surrey, by TransLink. The Rail for the Valley organisation, in concert with the Fraser Valley Mayors, has been advocating for the restoration of the Fraser Valley Interurban, which will go along way to realising the goals of many, which is that it is the community & the transit customer that matters. We build transit systems to move people; to provide a quality alternative to the car; we should not build transit to further increase population densities in already heavily populated areas or destroy neighbour hoods with the mantra, density is good. I been involved in transit projects since 1986 and nowhere else except Vancouver has taken such an active role to tie land use to transit, yet at the same time fore go all but cosmetic transit improvements on heavily congested routes. European colleagues have questioned our preoccupation with land use over the legitimate needs of the transit customer in providing a quality public transit service. Our growth in the region has been shaped and transit isn’t going to affect it much. While everyone is debating land use, farmland is being destroyed at a prodigious rate in the region, with the TFN announcement being a good example. Mayor Watts, her staff and advisors are well advised to consider the two following criteriaai??i? ?s, when they begin the `Redefining of the Community of Surreyai??i?? programme. Recently on Jarrett Walkerai??i? ?s Blog, Zoltan expressed the view that the ideal transit stop spacing was 400m. This appears too close, even for a Light metro in a built up urban environment. In the context of the cities of Surrey, 400 m is approximately every other block, by contrast on Skytrain the average station interval is 730 m in the city centre area and 1750 m in other areas. Accepted transit design & planning criteria, argue that people will generally be prepared to walk 500 m to a transit stop ai??i?? bus, LRT, Tram or ALRT, 2-3 Surrey block so a figure of 500 to 700 m is likely to be closer to the ideal. Transit does indeed shape land use, but in Vancouver we have created a bureaucratic monster, with hundreds of people shuffling paper and achieving very little over land use; what has been left out of the mix, is the transit customer. Vancouver is obsessed with high rise skyscraper living & working and expanding the SkyTrain ALRT system to provide ridership. On the aptly titled Skyscraper forum Skytrain apparatchiks, including Mezzanine, Vooney, Vonny & xd advocate for further SkyTrain building including in to Surrey, but then argue that BHLS, BRT & Express buses are all that Surrey needs. The budget saving that the bus would give over a SkyTrain extension is one thing; but to argue that Surrey and SoF deserves little more than a second class service because you advocate for higher TransLink spending in Metro Vancouver and compound it by posting a link to a French BHLS consultancy in order to rubbish surface Light Rail/trams is just perverse and dishonest. I believe this post should be in every newspaper in Vancouver and the lower mainland. We have forgotten about the transit customer and certainly, not much thought has been given to attracting the motorist to transit. According to TransLink, over 80% of SkyTrain’s ridership first take a bus to the metro and for me, this is a bad statistic. Buses are poor in attracting new ridership (Ottawa & Adelaide) and for people who do not like or want to take a bus, why then take a bus to a metro? Attracting motorists to transit is even a harder equation to solve and by blindly believing that SkyTrain automatically attracts hordes of former car users to transit is a little hard to believe, considering the massive daily gridlock faced by regional commuters, in Vancouver and the suburbs. What I find so sad is that transit planners have given up on trying to plan what the transit customer wants and instead plan for what the politicians want and if we continue in this direction, we will have spent a lot of taxpayers money on a very small mini-metro system, that fails to provide an affordable alternative to the car. I am very sorry that Mr. Rees takes umbrage about transit is “all about moving people” and has fallen into the land-use debate.